Some of the new students asked me why their wishes are not comming true, even if they tried Manifestationtechniques, Affirmations and Meditation. So i said there is a difference between heartwish and a egowish. The egowish comes from the lack and thinks: if i reach or have this i will feel better and my life will be easier, but mostly there is also a fear within, if i reach it what will come next? and what if the goal dont gives me that satisfaction what i thought? do i really deserve this? ect. 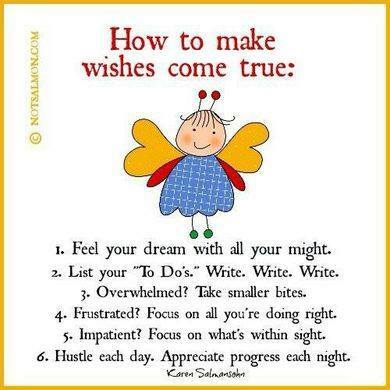 Mostly this wish is just an idea what feels nice but you dont want it 100% . Because if you would really want it for 100% you would have it. Because if you really want something you will find a way if not you will find an excuse. I saw that in my moneyseminars, people want money just because they think life will be easier then, but they dont love it out from the heart, if they would they would have money. money follows happiness, “everything what creates”(fear is the other direction) follows actually happiness. if you have a deepheartwish what makes you happy and is not created out of lack it will manifest very fast. You feel also more attracted to people who are happy right? with wanting you only create more lack. can you feel your resistance in your head saying that? do you feel some weird feelings in your belly? that are the stuck emotions in your intestine. The problem with your wanting is you just create all the time more lack, because you create seperation to it. By say i wish or i want that, you just say all the time you are in lack of that, theirfore you only can create more lack. so how should i manifest??? thats actually very true. how more you act like someone you adore, how more you will become that person . thats why also couples becomming very similar in their behaviour because they copy each other. We learn very fast by imitation, every sport everything we see we start to imitate and this goes faster then by explaining and when you put also the energiefield and the emotions to it like inspiration then you will learn extremly fast. and smile and can you feel how your chest is opening and expanding now? thats the way to live with easiness and happiness. if you say now but thats a lie i dont love myself….or its hard to me to say it …….. good you are finally honest with yourself, so we can go deeper to release also this pain. this is just the beginning to show you the difference and there are many other things to look at. In my seminars i go deeper till people starts to cry and release all their pain. And after one week i get the feedback that they got a new job , new love, new options and much more money and happiness in life and everything became much easier. So how can you find out know what is really a heartwish and what is just a nice idea what feels good?. Ask your subconscious how much in percent you really want it and wait till the number comes dont think about a number.. thinking is always past and your ego will tell you 100% but its a lie…. and when you have now 80% ask again what do you need to do or be to make it 100 % destroy all contracts and fears what doesnt allow you to reach this goal. The answer what comes quick is mostly the right one, when you think about it you already analyse it and you can through it away, because you want to have it and you just lie again to yourself. Dear Alexander, thank you so much for those affirmations. I can feel it happening by repeating it again and again. Please keep on doing what you do, I really believe that with what you convey to people will transform the mind of those who are willing to accept it and also themselves, to change. Nothing is constant, everything flows.